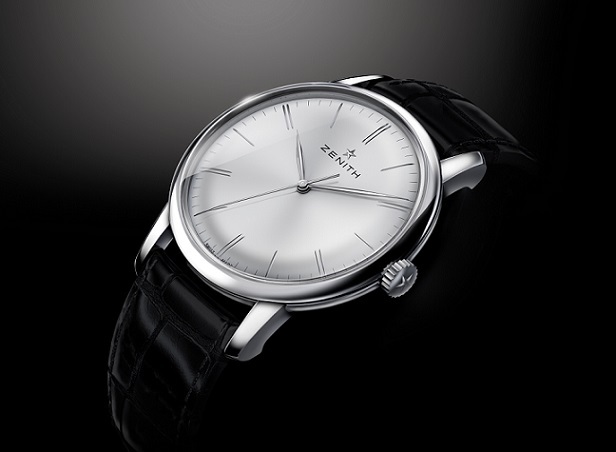 ZENITH presents the Elite 6150 model equipped with a new Manufacture movement: the Elite 6150 calibre. This new mechanical automatic movement is the contemporary version of the famous Elite base movement developed in the early 1990s – an ultra-thin calibre that earned the title “Best Movement of the Year” when presented at the Basel Fair in 1994. In response to the demands of our times, the Zenith engineers and developers have chosen to enhance its performance, as well as its versatility by means of a minimum 100-hour power reserve, a broader 30 mm diameter, along with a central sweep-seconds hand. They have also been careful to preserve the exceptionally slender nature of a movement measuring a mere 3.92 mm thick! Driven by the new Elite 6150 calibre, the Elite 6150 model is distinguished by its classicism and its understated elegance. Its slim 42 mm-diameter case frames a pure, cambered dial punctuated by sleek, graceful hands. A model clearly built to last. With the Elite 6150 model and its new Elite calibre, Zenith returns to the very roots of the traditional expertise cultivated by the House: that of an authentic watch Manufacture capable of developing prestigious complicated calibres as well as precise and reliable classic movements. To achieve this, it is bringing back to the forefront its famous Elite base calibre presented in 1994. While this three-hand Zenith movement is still considered one of the most dependable on the market, it had hitherto remained in the shadow of its illustrious relative, the legendary El Primero chronograph calibre. Such a lack of exposure was quite unjustified, since this sturdy and versatile movement has for more than 20 years been impeccably driving both ultra-thin watches and gem-set models from the Zenith range. Determined to perfect its proven qualities and to deploy its virtually unlimited potential within its collections, the Manufacture has therefore undertaken to raise the profile of the Elite calibre. In its contemporary version, the new Elite movement is enriched with enhancements meeting current demands such as a 100-hour power reserve and a more generous diameter. Thereby raised to peak capacity, the new Elite 6150 calibre is destined to be interpreted through a number of upcoming new developments and to occupy the place it deserves within the offer from the brand with the guiding star.